When I first started papercrafting, I was looking for all the scrapbooking tips I could find. I needed to learn everything from scratch and try things out for myself. If you are in that position, I hope you will enjoy these ideas and take a hands on approach to learning about the papercraft world. There seemed to be so many tools and techniques when I first started crafting, I was excited about learning them. I soon realised there was a knack to doing most things and I needed to learn those shortcuts and secrets. I'll tell you about some of them on this page. Just to reassure you if you are just starting out, you will find your own best and comfortable way to scrapbook over time. I hope those of you with experience will add your own scrapbooking tips below to help get some beginners scrapbooking with confidence a little sooner. And maybe I will inspire you to stretch your own honed skills a little. It is true that it takes practice to get to be good at new skills, so do give yourself some time to perfect your techniques. Practice makes progress! I needed confidence when I first started out, and getting familiar with these ideas and going ahead to make pages gave me that. Remember, it's all just paper! Let me encourage you to take risks with that paper. There are lots of ideas that help make scrapbooking the pleasure it is. You might like to bookmark this page as I will add more hints and tips as I discover them myself. Got ink on your skin and can't get it off? 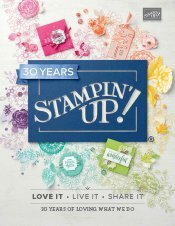 I discovered a way to remove Stampin Up! 's Classic Inks from my skin. Let me share the idea with you. Once you have created a special page, you want to protect it, right? Here's how to get a Page Protector on your completed layout easily and smoothly, without knocking your new creation around. Now, as I said at the beginning, I need your help. If you are already an experienced crafter, what things helped you when you first started paper crafting? How do you think about layouts before you create them? Did someone help you when you were a beginner or did you figure out most of it yourself? If you would like to add your own helpful scrapbooking tips, please do. And thank you for taking the time to do so. If you are a beginning crafter, what else do you need to know about that I haven't yet mentioned on this page? Tell me what you would like to know and I will see if I can help with more scrapbooking tips.